My life always seems to oscillate wildly (and widely) between the same-old same-old and running full-steam-ahead like there’s no tomorrow. I’d really love to learn how to strike a happy medium, but I’m not really holding my breath that will ever happen. First, there has been some knitting going on! The Victoria Socks are finally finished! (I’ve only been home from Victoria for what… a month? sigh In what passes for normal circumstances, I can knit a pair of socks in a week or 10 days or so. At least a pair for me – my feet aren’t that big. But I did stop to become obsessed by the Swallowtail Shawl. But still, these socks took longer than normal to finish. 1) I’ve rarely been home during daylight the last few weeks. 2) Autumn has returned to the Pacific Northwest, at least for now, killing any light I might have used had I been home. These colors are pretty true, though — at least on my monitor (maybe a touch too blue). They will be were bright and cheerful to wear on dreary winter days during the current blast of autumnal chill. I can tell that these will be a favorite pair of socks. 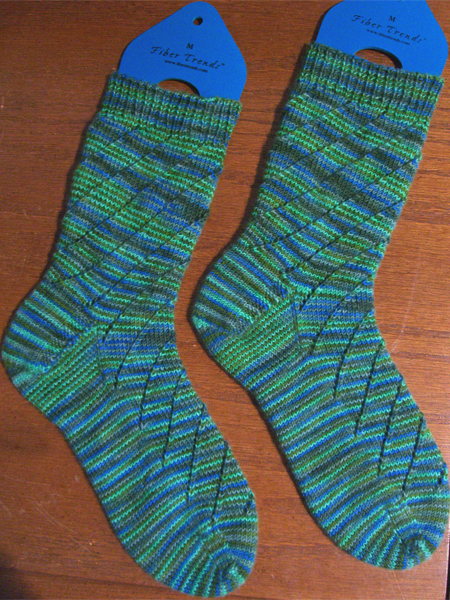 To guard against any knitting slow-down, as soon as I finished the Victoria Socks I immediately cast on a pair for #1 Son. He likes his socks to be fraternal, so I am knitting these from both ends of the skein. I think it’s rather fitting that the other night as I knit away, Moo Cow had unbeknown to me crept under my chair and one strand of Trekking had fallen within her grasp. My first clue was a slobbering, smacking, chomping sound. 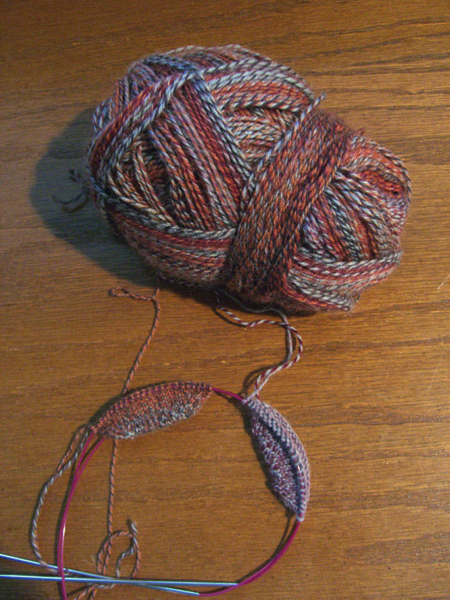 I hauled up the yarn and found it neatly – and wetly – sliced in two. So #1 Son’s socks have a join in the yarn, courtesy of his cat. Why this is fitting will be revealed below. Well, first, I’ve been totally slammed at work. The hours have been crazy, and the weeks long. Concepts like weekend that I used to take for granted became meaningless. I came home late and tired, and zombied in front of the TV for an hour before falling into bed for a too-brief-nap, only to wake up the next morning and to it all again. I did try to read. But writing seemed beyond me. The crunch ended, my body relaxed, and a cold hit me. Last night I went to bed with a sore throat, a hot toddy, a hot water bottle and a couple of warm kitties. Today I feel achy and blah. I think I need another vacation. Not that I’ll get one. But having one would be nice. A cruise to someplace warm, perhaps. Someplace where there’s sun. After he returned from his last tour and found a job (yum, those pastries! ), he made a very reasoned case for taking the little grubstake I’d set aside for him and moving out on his own. He’s not going to school and is concentrating on his music. And he had a place to live that was close to work. He is an adult now. And he is mature beyond his chronological years. So I agreed, with some normal mother-trepidation, that he could have his grubstake and strike out on his own. When his living situation turned out not to be what he had hoped for, he handled the situation with poise and grace. I have every reason to believe that he’s going to be just fine. He has focus and drive, and is the kind of person who the universe blesses most of the time, and will land on his feet when it doesn’t. But I haven’t blogged about it because… well… I’m not sure how I feel about this. I certainly didn’t expect to keep him at home forever, and he is ready to fly. But it is a little strange not to have him around – although I didn’t see him that much anyway. He’s good about touching bases with me every day or so and I know he’s doing well. My heart still skips a beat every time I hear that there’s been a car accident, or 18 year old man shot by police, or bicycling teenager hit by SUV. I know that most likely he’s just fine. I mean, really… He’s a good kid and the cops have no reason to shoot him. He’s also a good driver and a careful cyclist. But I have to physically force myself not to pick up the phone and make sure he’s OK. I miss him. That’s another mom thing. And Moo Cow misses him very much. When he visits home, she bounces around him, squeaking like a little puppy, until he picks her up and gives her a good cuddle. That’s why it’s so fitting that his socks will include a little Moo-present in the form of a yarn join. I need to get his socks finished, so his feet will be warm even if I’m not there to make sure they’re warm. It’s a mom thing, too. I’ve also purchased yarn for the blanket I plan to make for a house-warming gift for him. At the rate I’ve been knitting, it might be awhile before it gets knit. So it might not warm the first place he lives. But… it’s the thought that counts, right? 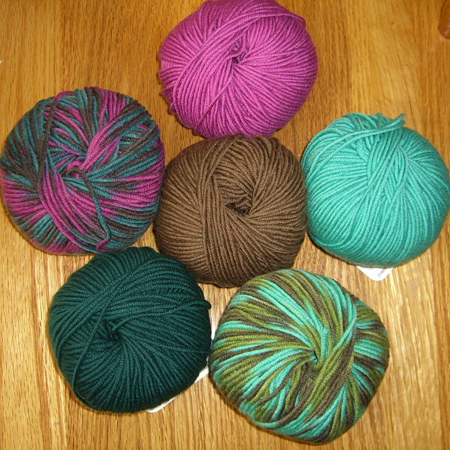 The yarn is Karabella Aurora 8 in colorways 39 (not pink), 50 (turquoise), 258 (mocha) and 1145 (dark teal); and Aurora 8 Space-Dyed in colorways 16 (the turquoise/green/brown) and 18 (pink, teal, brown). There will be several 12″ (or so) squares of each color in different stitch patterns. Please remember when looking at these colors that many words may describe #1 Son, but conservative is not among them. Alice and I, along with the resident Tangle teenager, tried about a bazillion colors before coming up with this combo. The teenager pronounced it perfect. And, yes, #1 Son is “OK with pink,” just in case you wondered (several other knitsters did). He used to have pink hair. A partially pink blanket should be OK. But, most importantly, his mom will know he’s warm, no matter where he’s living.